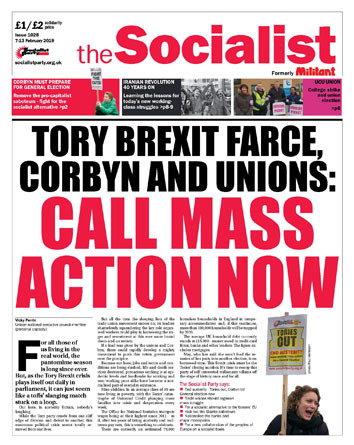 Socialist Party member Chris Baugh won the recent re-run election for the broad left of the civil servants' union PCS - Left Unity (LU) - nomination to be its assistant general secretary (AGS) candidate. Chris won by 181 votes to 163. Chris should now be the agreed AGS candidate on the Democracy Alliance (Left Unity and PCS Democrats) slate. However, a statement from LU secretary Gordon Rowntree says the PCS Democrats will not accept Chris Baugh, so he will not be the Democracy Alliance candidate. Chris will be put forward separately as the LU candidate despite LU conference instruction to agree a full joint slate with the Democrats. Even this was only grudgingly conceded by Rowntree. PCS Democrats' base of support among the union's membership is far smaller than Left Unity's. Disgracefully, Rowntree seeks to justify the position of Socialist View and the Socialist Workers' Party (SWP), who hold a majority on LU's national committee, by stating that some LU members, including apparently the SWP, have said they are "not willing to support Chris as AGS". Whether any individual LU members support Chris or not, he is the elected LU candidate for AGS. LU rules require them to recommend and campaign for all LU agreed candidates. Chris Baugh has been the elected AGS since 2004, having stood successfully as LU candidate three times. He has an outstanding and unmatched record, over 40 years as a left lay activist and elected senior full-time officer. PCS General Secretary Mark Serwotka is backing full-time official Lynn Henderson. Henderson is not a LU member and has made no contribution to building LU or democratising the union. Over the last 18 months the campaign against Chris, initiated by Mark Serwotka, has failed to impress. The current claim is that Chris does not support the union's national pay campaign. This allegation is a complete lie. Chris has always been clear: "I will support and fight for the union's national pay campaign, as I have always done." Chris Baugh's only 'crime' has been to call for an open and full debate on the strategy, not ruling anything out, to win the 2019 pay campaign, for which he has simply put forward some tactical suggestions. 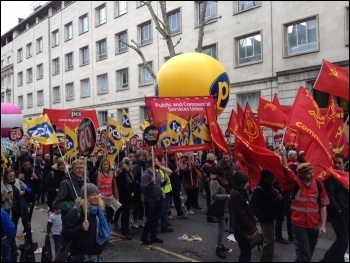 The SWP described the 2005 pensions deal as "shabby", but said they would continue to work with Mark Serwotka as "honest debate over issues is not a barrier to this, it is essential." Now Gordon Rowntree says the SWP will not support Chris. We reject these divisive and undemocratic manoeuvres by the LU national committee majority. But we must not allow frustration and anger with these antics to distract from the fight to re-elect Chris Baugh and secure the re-election of the Democracy Alliance national executive committee slate. Chris Baugh is the LU candidate for AGS, the LU national committee and all LU members must campaign for his election.